Students returning for fall semester at SUNY campuses across New York State were greeted with more than $35 million in upgrades, all executed by DASNY in 90 days or less after students left campus this summer. The improvements will make SUNY campuses across the state more attractive as they compete for the world’s top students, educators and researchers. Strengthening these institutions creates a sturdy foundation for New York State’s communities, making them a better place to live, work and learn. "Speed and efficiency are two hallmarks of the services DASNY provides and these projects serve as a perfect example," said DASNY President & CEO Gerrard P. Bushell. "We look forward to continuing our long-standing partnership with SUNY campuses to provide students across New York the best possible environment to learn and grow as future leaders, innovators and creators." The work was spread among 12 SUNY campuses and received praise from students. Funds for the projects were derived from student fees. At SUNY Potsdam, $750,000 was spent on environmentally-friendly renovations, including LED lighting and water-saving devices such as low-flow shower heads, toilets and faucets. At SUNY Brockport, $809,000 was spent renovating Perry, Bramley and Biggs Halls to open up and brighten entryways, among other changes. More information on the projects was provided in a press release from Governor Andrew M. Cuomo. You can also find an in-depth dive into work DASNY did at the University at Albany under DASNY’s “Success Stories” on DASNY.org. 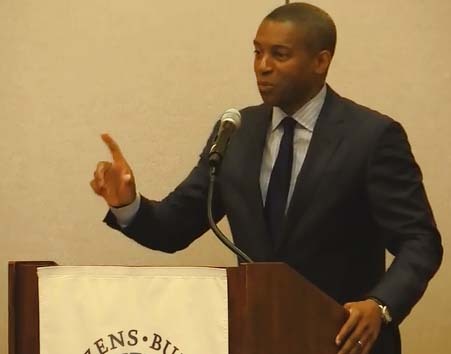 On September 21, DASNY President and CEO Gerrard P. Bushell spoke to the Trustees of the Citizens Budget Commission, delivering a message on his efforts to streamline and create efficiencies at DASNY so that it operates more like a private enterprise while remaining committed to its public mission. “For New York State’s economy to grow and succeed, it must be an attractive place for people to live, work and learn,” Dr. Bushell said. “There must be access to best-in-class health care and world-class schools, from kindergarten through the highest level of academia. Our communities must be sustainable, resilient and inclusive. "As the nation’s largest issuer of low-cost, tax-exempt bonds and one of the nation’s biggest public builders, it is DASNY’s job to deliver this foundational infrastructure while broadening opportunity. Dr. Bushell went on to describe his efforts to expand DASNY’s use of alternative project delivery methods; DASNY’s overhaul of its financing guidelines and policies; and how he has realigned the organization to streamline operations and put a renewed focus on MWBE contract participation. The Citizens Budget Commission, a budget watchdog, recently referred to DASNY as “an important state entity for infrastructure investment, and its expertise will continue to help New York State, its municipalities, and nonprofits, design, construct, and finance public-purpose infrastructure”. You can read the full profile here (http://bit.ly/2coTnUm). DASNY and the New York State Energy Research and Development Authority (NYSERDA) announced the training of 33 DASNY staff members to implement New York State’s new, stricter Energy Conservation Construction Code for buildings. The new code goes into effect October 3 and supports Governor Cuomo’s Reforming the Energy Vision strategy to build a clean, resilient and affordable energy system for all New Yorkers. Buildings represent about 60 percent of the state’s total energy consumption, so improving codes creates an opportunity for energy savings. The training, supported by a NYSERDA grant, positions DASNY’s Construction Division to implement the code for facilities it builds for its clients. For an in-depth look at the training and its implications, please visit DASNY’s “Expertise Portal” on DASNY.org. More information about Reforming the Energy Vision was provided in a press release. 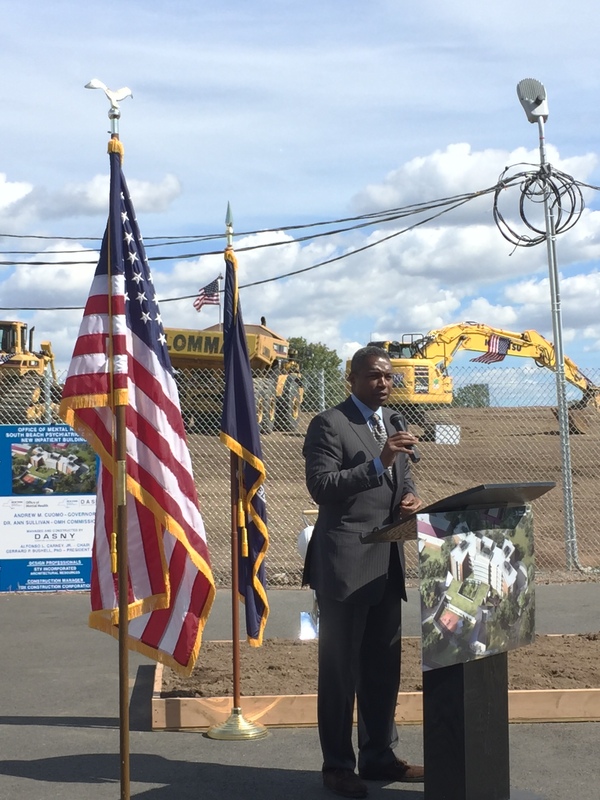 On September 26, DASNY President and CEO Gerrard P. Bushell and Office of Mental Health Commissioner Dr. Ann Sullivan broke ground on the new inpatient residential building at the South Beach Psychiatric Center in Staten Island. The $250 million, 226,000-square-foot facility replaces 47-year-old buildings that are currently below New York State flood zone height requirements. The new inpatient residential building will provide a home and a haven for some of New York’s most vulnerable residents as they seek renewal and recovery. At least 31 percent of the $250 million will be spent with minority- and women-owned business enterprises. DASNY is also executing on a commitment to hire from the surrounding community. Inside the facility, workspace will be configured to support a team approach to direct patient care and facilitate collaboration. These stations will enhance relationships between patients and staff, creating the opportunity for care to be tailored to individual patients.